There are three types of wasteful that I can think of ( there may be more ? ). When you leave the door open during winter and let all the weather come tumbling into your reception area, you are practicing behavioural waste. Well insulated boundaries of your building are easily bypassed by a few ounces of thoughtlessness. Thoughtless waste trumps good construction (or building planning). You may have the door closed to keep the weather out, but when you had your building designed to such a poor specification you were (perhaps inadvertently) planning for waste. Such buildings may as well be in the open air for all the difference that closing the door makes. Planned Waste trumps righteous thinking. During a period of dramatic climate change accidental waste is almost as stupid as using patio heaters ! Why only "almost" ? 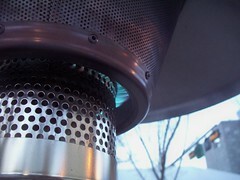 - because astonishingly the patio heater was perfectly designed to promote climate change ! But it isn't just patio heaters - "obligatory waste" is rampant. These last types of stupidity are often socially driven and suggests our society is wholly immature. We are conditioned to consume and if we cannot consume then we simply demand and dispose of the excess that we cannot use. A World War II poster encouraging kitchen waste to feed animals. Is deliberately throwing energy away - in the interest of achieving a questionable marketing effect really wise ? I say questionable, because very soon, (I hope) this sort of nonsense will be considered socially reprehensible, and then it will be criminalized and finally it may be stopped. The only real cures for obligatory waste are an escalation of educational context and social discipline, from gentle encouragement, through social ridicule on wards to compulsory instruction and ultimately if necessary harsh punishment. Our great grandchildren may end up screaming for execution for even the thought crime of waste! Humanity knows it is screwing up the climate (apart from those with clear political agendas, and perhaps a few outliers whose ignorance and inability to face reality is hard to fathom or beyond the pale). BTW "beyond the pale" refers to a paling fence or demarcation line to delineate gettos, as a reprehensible social engineering tool (typically anti-semitic or pro-anglo-saxon) it is revolting. So I do not mean it as a racist comment, but use it deliberately to refer to a class of people to whom we must become intolerant in the common interest (including theirs). However, this was not where this blog post goes. I wanted to make a simpler point. If you want to fix "Planned Waste" then you had best address "Thoughtless Waste" first. Why - because the first can be bought but not bought well in the context of the other, and the other must be learned - and cannot be bought at any price. If thoughtless waste is addressed, it comes at the princely price of a penny - as in "a penny for your thoughts". So payback is immediate and it clears noise away so that investment in reducing "Planned Waste" can be made in the context of a reasonable operation. Please remember that thoughtless waste includes, not turning down thermostats, not adjusting time-clocks and making unfounded assumptions about needs. Regarding the last "Obligatory Waste" - can only say that the obligations are rules made to be broken. Waste is always wanton. So preventing waste always allows the actor access to the higher ground. A few people saying no I won't sit under heaters designed to heat outdoors makes some direct difference, but a social movement of intolerance towards profligacy is overdue and undervalued - but "the times they are a-changing"
Can it be that Google said - Too hard let's go home? Is advertising better managed than engineering ? I want to consider this apparently absurd notion in light of three quotations of wisdom that people find at first slightly ironic. Each of these rings a bell of obvious inner truth that we recognize instantly and trust. "Water, water, every where,Nor any drop to drink." EnergyStar claims 2nd Law Thermodynamics wrong ! How much energy is wasted in buildings ? read in light of the EPA brochure Energy Star by the EPA, pretty soon you are faced with a nonsense that appears to be systematically overlooked. 'The Average Building' Wastes 30% of the Energy It Consumes'. George is the most recent member of our full time team, studied product design and has energetically run his own solar company before being enticed over to join us, with promises of hard work, no pay and only the very occasional reward of sharing a beer with some great start-ups in Paris. If George keeps at it we will be reaping such rewards as he builds relationships all over the globe! Please give George some feedback below - this is his first ever radio interview and I think he nailed it ! Today a very brief post. Yesterday I pitched our solution to LeWeb in Paris - Six minutes of pure adrenalin and some Q&A. Please give feedback - we need to know what to work on !